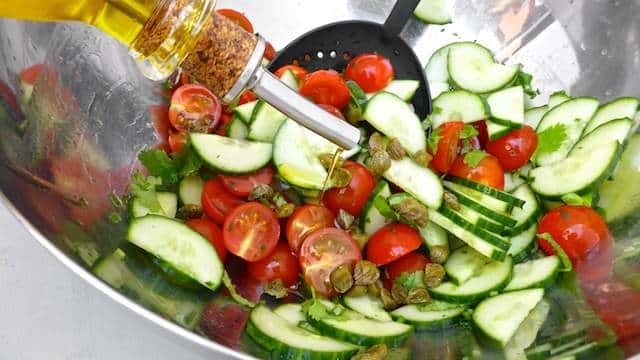 Summer Salad Recipe with Manouri | Simple. Tasty. Good. 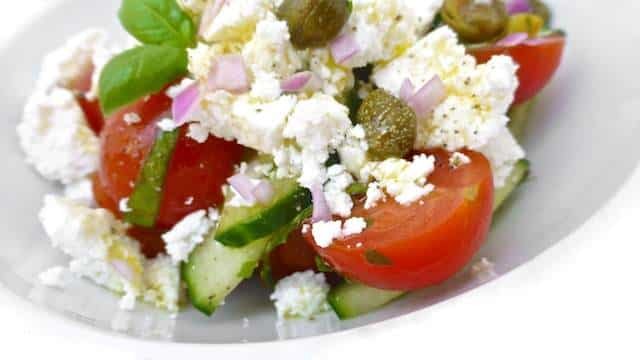 First of all, this summer salad recipe might look like a Greek salad, I agree. But then instead of buying the usual black olives I decided to add the handful of salted capers I had in my fridge. 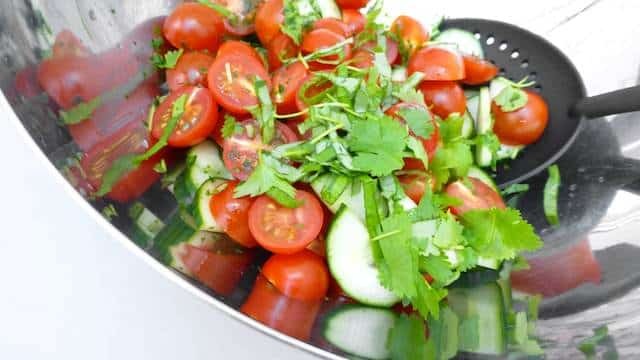 Thought that would give this salad an extra flavor punch together with the fresh herbs (I used fresh basil and mint from my outside little herb garden). But a sprinkle of dried herbs will also do of course! The most obvious choice of Greek cheese is feta of course but I couldn’t find any in my supermarket. So then I used manouri, a sheep’s milk cheese that is quite similar in taste and texture. Perfect! Here is my summer salad recipe, a fresh and freaking delicious salad for a quick lunch or a light and flavorful summer dinner! Wash the cucumber well and chop off both ends. 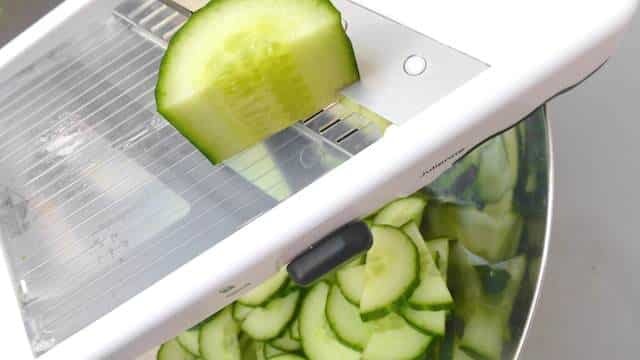 Cut the cucumber lengthwise in half and then slice it up using a sharp knife of a mandoline slicer like I did. 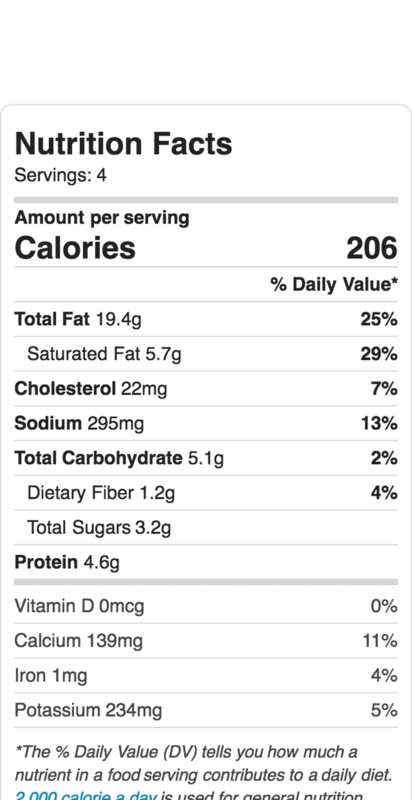 Add the cucumber to a large mixing bowl. Rinse the cherry tomatoes. Pat them dry with a clean kitchen towel and slice the tomatoes in half. Then add them to the bowl with cucumber. Chop up the fresh herbs you've chosen for this recipe and add them to the sliced vegetables. Add the salted capers together with a little splash of good quality olive oil. Season with a little pepper and salt. Stir well and then check the seasoning. Add extra pepper or salt to taste if necessary. Chill the salad in the fridge for 10 minutes. Transfer it onto deep plates or bowls. Garnish with some crumbled feta cheese. Finish with a little sprinkle of olive oil and some freshly ground black pepper. Serve cold.